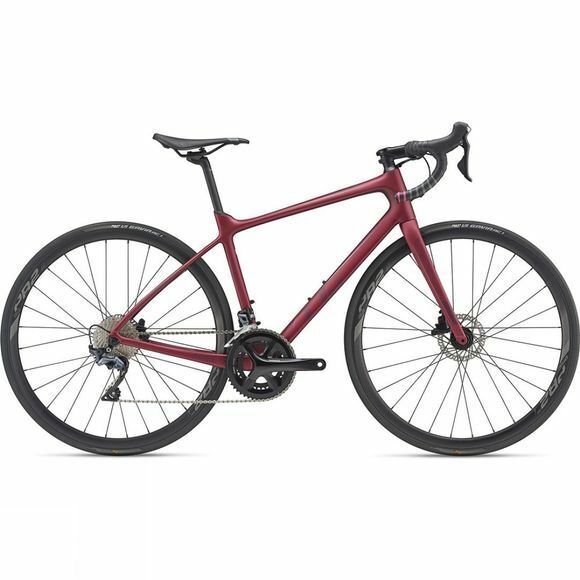 The Avail Advanced 1 2019 from Liv is a versatile endurance road bike that will lead you to search for new challenges each ride. With both climbing agility and descending composure, you can be sure that this is a responsive, energetic and determined bike. This well-designed machine will help you cover miles with confidence and ease. Built around an Advanced-grade composite frame, it features an exceptionally lightweight endurance geometry, for all-day riding at speed, with a special carbon layup tuned specifically women. You can also expect unprecedented pedalling and cornering stiffness combined with expert handling and control. The OverDrive steerer tube and PowerCore bottom bracket work together to create increased frontal stiffness, precise steering and pedalling efficiency. Reliable Shimano Ultegra components allow for accurate shifting and the large range of gears mean that the climb and the decent are equally exhilarating. Disc brake technology provides confidence and control in variable weather, maintaining stopping power on wet roads. The frame and fork can accommodate larger tyre sizes to in order to allow for increased comfort or make it easy to tackle choppy pavement. This bike allows you can take the roads less travelled with adaptable comfort, especially thanks to the D-Fuse seatpost that reduces road vibration and keeps you fresh for the long haul. Specific composite layup and tube shaping, including ultra-thin and flattened seatstays, a low seatstay/seattube junction, and thin, slightly curved fork legs combine for a balanced, compliant ride quality and reduced rider fatigue. To sum it up, the Avail Advanced 1 2019 makes big days in the saddle all the more magical.